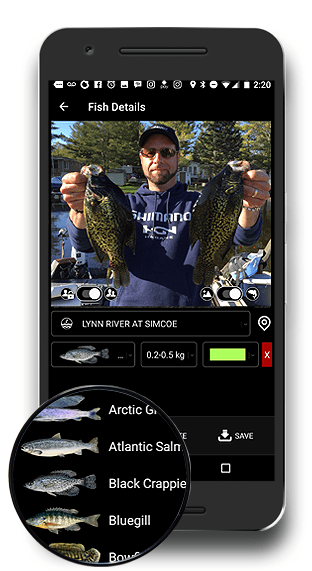 An innovative fishing app designed to help you better understand conditions and get back to your spots. Before you take your photo, the preview panel helps to ensure your mobile device GPS has recognized your current location and provides a visual cue of your geographic location. FISHBUOY Mobile provides you with the ability to keep all your fish records private. You do not need to share photos to see the value of FISHBUOY. By default, the "private" photo option is selected. When taking a photo, you have the option to share it with the FISHBUOY community by swiping to the "public" option. You may at anytime in the future change this to private. Want to simply take a photo as a visual cue of general environmental conditions? Have the leaves turned color and fallen off the trees? Is the water murky or clear? Are spawn beds present? Have lily pads or weed beds formed? All these non-fish photos act as great clues for timing your next trip. Simply swipe from 'Fish' to 'Environment' when taking your photo.